Texas' unpopular statewide standardized test is once again caught in legislative crosshairs, this time after a controversial Texas Monthly article has questioned whether the test was evaluating elementary and middle school students based on reading passages that were one to three grades above their level. Texas Education Commissioner Mike Morath, along with academic experts and educators, will appear before the House Public Education Committee on Tuesday to answer questions about the test, known as the State of Texas Assessments of Academic Readiness, or STAAR. Then, the panel will consider a slate of bills proposing slashing the number of state-required STAAR exams. Educators and parents have been arguing for years that the STAAR is too high-stakes and an inaccurate measure of whether students are academically succeeding. Lawmakers have generally been sympathetic to this argument, passing laws over the last several years to drastically reduce the number of required exams and shorten the length of some assessments. But the Texas Monthly story has brought a new round of scrutiny. The article is based on two studies, from 2012 and 2016, which ran test passages through formulas designed to analyze their complexity and found they were generally too challenging for students. Education advocates are pointing to the studies to argue that the state is wrongly judging whether students can read at grade level, placing them in needless remedial instruction and unnecessarily penalizing schools and districts. Student scores on the STAAR are the main component in determining school and district ratings, and part of determining whether students have learned enough to move up a grade or graduate. In 2018, just 46 percent of Texas students were at or above grade level for reading or English. "Politically, there's probably more of an appetite this session to do something about STAAR," said state Rep. Gary VanDeaver, R-New Boston, a member of the House Public Education Committee. "What that is remains to be seen." VanDeaver will present a bill to the committee Tuesday rolling back the number of state-required STAAR exams, closer to the federally-required minimum. "This new information coming out certainly gives us an opportunity to push the pause button and do some real research" on STAAR's merits, he said. Texas Education Agency officials, meanwhile, are defending the test. Two days after the Texas Monthly article was published, the agency sent a letter to lawmakers saying that the formula used in the studies is "inappropriate" for judging whether STAAR exams are on grade level. That formula — called a "Lexile measure" — uses factors such as the number of syllables per word to judge the complexity of a book or passage. Generally, teachers use Lexile measures to match students with texts that match their reading ability or monitor whether their skills are growing, according to Eleanor Sanford-Moore, senior vice-president of research and development for MetaMetrics, which owns Lexile. Lexile measures are not used to match a text to a certain grade level, and they have limited use in determining whether a state assessment like STAAR is grade-appropriate. 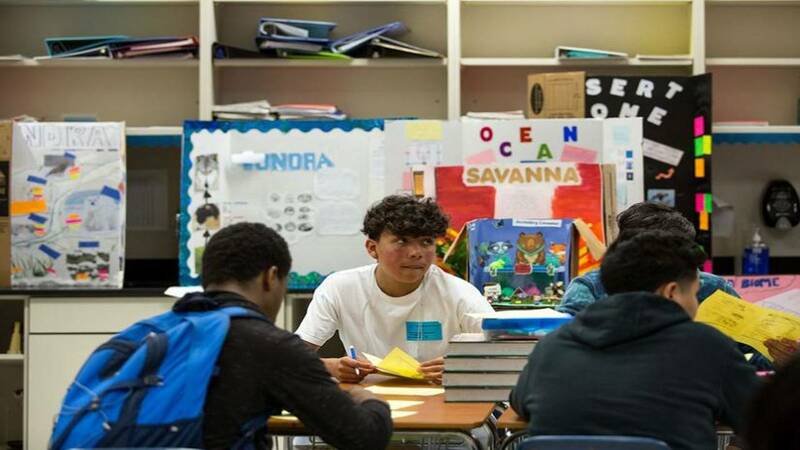 "These types of [state standardized] tests will have a range in the difficulty of passages so that students of differing ability levels can have access to passages at their reading level," Sanford-Moore said in a statement to the Tribune. But advocates argue that teachers are expected to teach grade-level text in the classroom, and use Lexile measures as one piece of evidence showing whether students are succeeding. "If you have a kid and you've told their parents in parent conferences that their student is doing well, they're making progress, they're reading on grade level, and here's all the data we have to show your student is doing well — and then it comes back with the label of approaches grade level? That is confusing to teachers," said Dee Carney, associate at consulting firm Moak, Casey and Associates, and part of the coalition calling for the state to reconsider using STAAR. The TEA's memo also said Texas' performance in elementary school reading has stagnated since 2007, according to national measures, and the STAAR results match this trend. It also pointed out that the TEA already updated the STAAR to better align with grade level after similar outcry in 2016, in order to "increase public confidence in the STAAR." Despite the change, STAAR results still remain flat. The intensified backlash against STAAR could have immediate ramifications for legislation this session, since lawmakers earlier this session mulled school finance reform measures that could tie school or teacher funding to standardized test results. The backlash could also impact the state's decision to levy sanctions on districts like Houston ISD, which has four chronically low-performing campuses. At least one lawmaker is already calling for a reprieve until an investigation of STAAR's difficulty is complete. "During the investigation, all school closures and school accountability evaluations should be halted until there is certainty about STAAR's reliability," said state Rep. Diego Bernal, D-San Antonio, in a statement the night the Texas Monthly article ran. "TEA owes a public explanation of the current situation to the thousands of parents and students who are now questioning whether their children are underperforming." It is unclear whether the Senate will carry out its own investigation of the test. Sen. Larry Taylor, chairman of the Senate Education Committee, said last month that he has faith in the STAAR because "it was put together by Texas teachers." Current teachers are part of the process for deciding which passages are selected for the exams and must determine whether they are appropriate for the grade level. "If Texas public education is having a hard time teaching children to read, the answer to that problem is not to stop testing to see if kids can read," said Kara Belew, policy advisor at conservative Texas Public Policy Foundation. A spokesperson for Educational Testing Service, the company that administers and grades STAAR exams, declined to comment on the current debate, referring all inquiries to the state. Last spring, more than 100,000 students were affected by computer glitches on standardized tests this year, either experiencing slow connectivity or trouble logging in — resulting in a $100,000 penalty for ETS. Disclosure: The Texas Public Policy Foundation and Educational Testing Service has been a financial supporter of The Texas Tribune, a nonprofit, nonpartisan news organization that is funded in part by donations from members, foundations and corporate sponsors. Financial supporters play no role in the Tribune's journalism. Find a complete list of them here.